Peas and beans are excellent sources of plant protein, and also provide other nutrients such as iron and zinc. They are similar to meats, poultry, and fish in their contribution of these nutrients. Therefore, they are considered part of the Protein Foods Group. Many people consider beans and peas as vegetarian alternatives for meat. However, they are also considered part of the Vegetable Group because they are excellent sources of dietary fiber and nutrients such as folate and potassium. So just tried this recipe with peas and beans as a rich protein option . use any pulses of your choice . Soak chick peas. Soya beans, white kidney beans for 5-6hrs/ overnight and pressure cook for 4-5whistles set aside. In a pan dry roast peanuts on a medium high flame and allow it to cool. Then ground roasted peanuts, sauted onion mixture to a smooth paste and set aside. Heat 1tsp oil in a pan splutter mustard seeds, add chopped snowpeas , eggplant and saute until its almost half cooked . Add ground paste and pressure cooked peas and beans to eggplant – snow peas and continue to cook. If the gravy is too thick add 1-2glasses of water and cook on a low flame for 8-10 minutes and bring to boil by stirring in between as you see bubbles on top turn off the flame and garnish with coriander. Serve it warm with rice/ rotis. No oil used while sauting onion, 1-2tsp oil can be added as per taste. I used the peanuts with skin you can remove the skin / use roasted skinless peanuts. You can use coconut instead of peanuts or combination of both. As peanut itself oozes out enough oil tried to avoid oil as much as possible so you can use accordingly as per your preference. 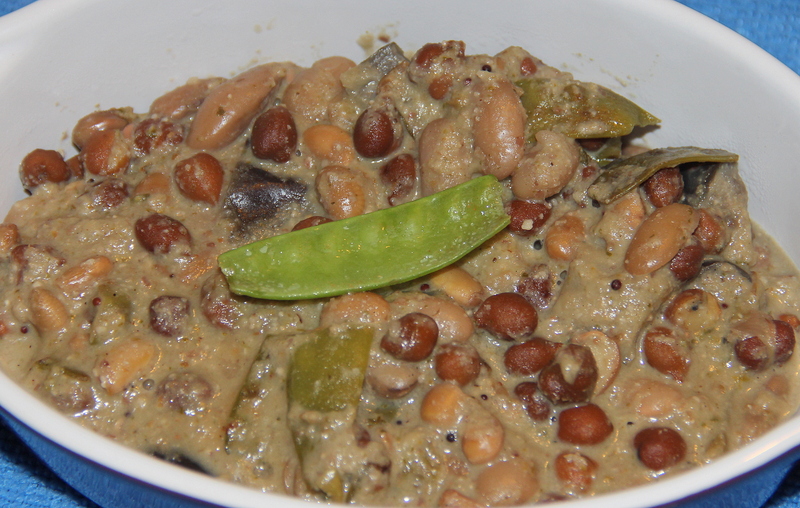 Posted on June 12, 2014, in Indian, Side dish and tagged beans, drchdietfood, indianrecipe, peas. Bookmark the permalink. 2 Comments. this is so healthy ..